The beauty of modern mobile intergalactic communication devices is that they have cameras. This means that when a photographic opportunity comes along (that doesn’t require lightning reflexes) a device can be whipped out and the moment captured. Such an opportunity presented itself at Waitrose over the Bank Holiday weekend. Entering the high class superstore I swiped my pre-registered credit card at the bank of scanners and waited for one to flash. Sometimes when I have a kid in tow we play the “guess which scanner it’s going to be” game. This time I was alone but running my eyes over the array of handheld devices in front of me I found that one of them had an error message on the screen. Thrilling1. Quick as a shopper spotting the last bargain chicken in the reduced items shelf I drew the camera from its pocket shaped holster and speedily took a number of photographs. I had to be quick because I didn’t want to find myself explaining to a growing queue of shoppers waiting to pick up a scanner. I got lucky. No queue formed. I got the pic, picked up the flashing scanner and moved on. Now, in the comfort of my front room, flicking through the gallery on my phone I’ve found the photos and am prompted to write this post. I Googled “QuickCheckHHTApplication.exe”, the on scanner screen message, but very disappointedly found nothing. Not a surprise really considering the secure nature of the transactions the device is required to process. With hindsight I should have had a play with the scanner and selected “details” as suggested on the screen. 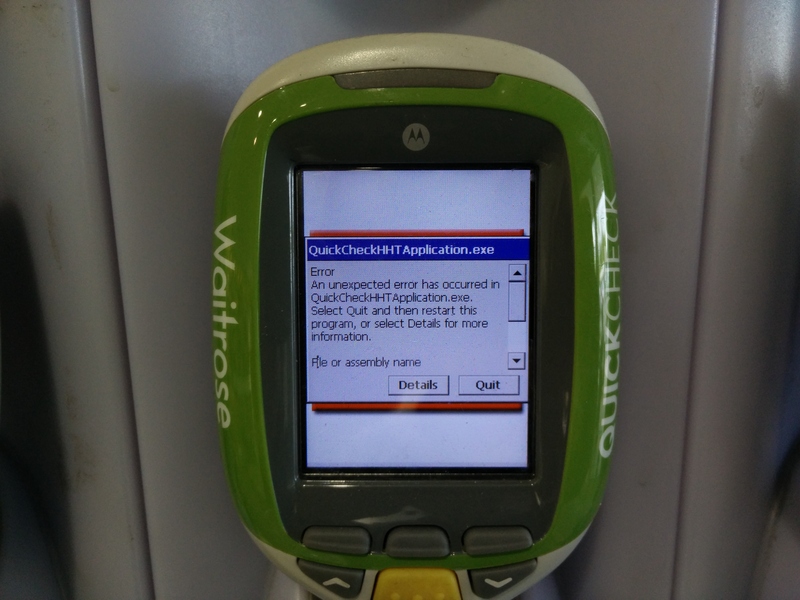 The screen shot isn’t quite as bad (or embarrassing) as the Windows XP screen that sometimes comes up when ATMs need rebooting but it is interesting in its own right. In an ideal world I’d now write a nice little technical appraisal of the functionality of a supermarket scanner but I know noottthinnngg. Could look it up I s’pose but then again I did Google QuickCheckHHTApplication.exe and got nowhere which is more than enough prep for this post. As much as it deserves anyway. If anyone has a photo of any public device that requires a reboot by all means share. Also if you know anything about supermarket scanners feel free to suggest a guest post. It will be given top priority/stop press2 etc. ATM posts here and here. ATM images on Google here (I searched on your behalf). Supermarket scanner images here. 1I know I know. Little things eh? I bought three 500g packs of lamb mince yesterday for £1. They were originally £4 each but buy 3 get £2 off. I then noticed they were reduced to £2.50 but as i stood there staring and trying to decide whether to buy them the guy reduced them to a quid. So I bought three at £1 each and then got a further £2 off. Result. Will now have to find something to do with lamb mince! In an idle moment I printed 4 storecard barcodes on to a single piece of paper to save filling my wallet with cards. (Note Tesco has to be a scan). I often wave them at the checkout myself instead of giving to the assistant and showing which is the relevant one. Last week in one store they asked if they could take it and check it. Came back and said it’s OK, but I must ask the assistant to scan it. Question – is there a magic barcode that gets you free food or, more exciting for some here, reboots the store system or worse? My biggest annoyance with all self service systems is that no real human being has ever had any input on developing them – they cant have else the UX on them wouldn’t be so awful. Example: Sainsburys self checkout, if you put your credit card in to pay, it tells you that you need to go back to the payment screen and select your payment method. It knows you’ve just put your credit card in, but you have to press back, then select credit card to be able to pay! As for Post Office self service, I think that was just a collection of code thrown in a blender then compiled. It’s so backwards it’s unbelieveable. Looks like someone touch the screen already because the letter I in ‘file’ is highlighted!